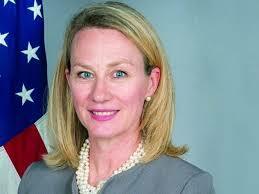 KABUL: Alice Wells, the US’s Principal Deputy Assistant Secretary for South and Central Asian Affairs, said this week that in order to ensure security in Afghanistan a negotiated political solution that includes Pakistan needs to be found. In an interview with TOLOnews, Wells said continued pressure on the Taliban and Pakistan was needed. “Ultimately the solution to Afghanistan’s security and stability will lie in a political resolution not only on the military battlefield. “But until then we are going to pressure the Taliban and we are going to support the really courageous and brave Afghan National Security Forces,” Wells said. According to her, US President Donald Trump was clear on Pakistan when he revealed his strategy on Afghanistan and South Asia last year. “We see an opportunity for Pakistan to secure its legitimate interests through support for a negotiated settlement. We see the South Asia strategy as an opportunity for Pakistan. Wells stated Pakistan needs to be part of a wider solution for Afghanistan and that as dialogue with Pakistan continues on the US’s part, it is important to achieve results around peace that are mutually beneficial for both Pakistan and Afghanistan. On the recent spate of attacks in Kabul – specifically the deadly bombing late January which killed over 100 people – Wells said this was testimony to some elements within the Taliban who are not prepared to work for peace. “We need to keep the pressure on the Taliban and recognise that it is the Taliban that has prevented your country, your society from moving forward,” Wells said. Asked about contradicting reports around Daesh in the country – with some sectors stating the group is not a serious threat, while others have raised concern about increasing numbers – Wells said the US was concerned “about some countries efforts to justify their relationship with the Taliban in order to fight against ISIS (Daesh)”. She said, however, that it was the Taliban that had allowed this “ecosystem” to develop where “terrorist groups like ISIS-Khorasan (Daesh) could take root”. Wells said the only way to defeat Daesh in Afghanistan was by defeating the Taliban and ensuring the Afghan security forces have the capacity and strength to sustain this battle. On other issues relating to the National Unity Government, its stability, elections and the matter of President Ashraf Ghani having ousted Balkh provincial governor Atta Mohammad Noor, Wells said that the US supported government in all its challenges and that it was standing by the IEC in order to ensure transparent elections but that some issues were internal matters that needed to be resolved by the NUG. This was specifically related to the Noor issue. According to the US embassy in Kabul, Wells, who was on a three-day visit to Kabul this week, met with Afghan officials including Ghani and Chief Executive Abdullah Abdullah.